Last fortnight, there were a lot of creased brows in India when it emerged that Indian students in the United States were being 'tagged' using electronic anklet devices, in the wake of an immigration scam. Last fortnight, there were a lot of creased brows in India when it emerged that Indian students in the United States were being 'tagged' using electronic anklet devices, in the wake of an immigration scam. This is not the first time that this controversial technology has been used in the US to track people. So, how does tagging work? Well, a device - bracelet, anklet, dog tag - is attached to the offender authorities want to track. The device can then use either Global Positioning System (GPS) or Radio Frequency Identification (RFID) to track the movements of the person. Tags using RFID come with an integrated circuit that processes information, and an antenna that receives and broadcasts it. In GPS tags, a single chip-based system is employed that broadcasts data to a satellite, which, in turn, relays the coordinates of the tag at periodic intervals. In anklet or bracelet tags, like the ones attached to the Indian students, the device transmits information to a central hub connected to a phone line or mobile phone. That data is then broadcast to authorities. An alarm goes off as soon as the tagged person goes out of reach. Two years after former Satyam boss B. Ramalinga Raju confessed to cooking the books of India's fourth-largest software services company, the trial is still dragging on in a special court. To be fair, the Satyam scandal, despite Raju's confession, is one of the most complex corporate frauds ever. The Central Bureau of Investigation, or CBI, had listed nearly 700 people as witnesses in the beginning, but has whittled that down to 400. Of these, only 100 have deposed in court so far. While the Supreme Court has set a deadline of July 31, 2011, for the special court to complete the trial, even after that Raju and the other accused have the right to contest the verdict in the apex court. Guess this is one case where one will have to wait a few more years before justice is served and administered. Physician, healthy doodle. This is the sum and substance of the latest letter written by pharmacies in Mumbai to doctors in the city, asking them to better their scrawls in prescriptions. The Retail & Dispensing Chemists Association, an umbrella body of 5,800 pharmacies in Mumbai, has suggested that doctors either issue printed prescriptions or write them in capital letters. If that sounds like pharmacies are making a mountain out of a molehill, consider this: a recent report by the Institute of Medicine in the United States stated that more than 7,000 Americans died annually and 1.5 million got worse, rather than better, due to wrong dosage as a result of sloppy handwriting. Seems like doctors, across the world, are dishing out the strong and wrong medicine. Japanese cuisine has become a favourite the world over. With so many sushi menus to choose from, a little know-how about sushi goes a long way. 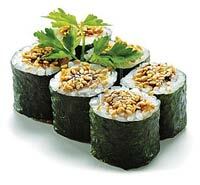 Contrary to popular belief, sushi originated in China, not Japan, as a way of preserving fish. It is wrapped in rice and fermented to keep the fish edible for longer periods. Sushi was meant to be eaten by hand, which is why a wellmade, traditional "nigiri" sushi roll breaks when you use chopsticks to dip it in soy sauce. The essential ingredient - wasabi - is actually very difficult to grow; most restaurants make a wasabilike mix using horseradish powder, mustard and green food colour.